The components of the emergency system set can also be ordered individually to expand/extend the system. 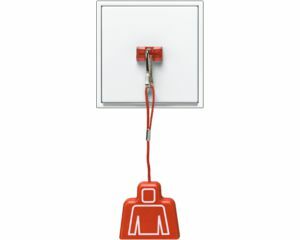 An emergency call can be initiated in the bathroom or WC by means of an easily reached pull cord. 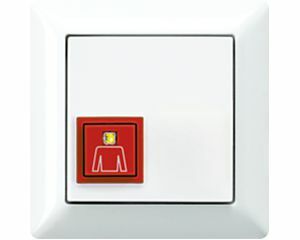 The pull cord push button can either be mounted on the wall or in the ceiling, depending on how it can best be reached by the person requiring help. Ideally, the emergency signal should be installed outside next to the WC or corridor door to show from which room the emergency call is coming. 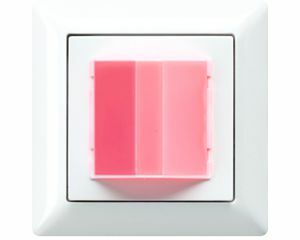 The module signals visually by a red LED and acoustically by a buzzer that an emergency call has been initiated. 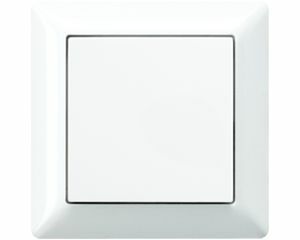 The reset button is also installed in the same room in which the pull cord push button is located. The persons giving assistance can then switch off the emergency call that had been initiated. This thus excludes the possibility of an alarm being accidentally or unintentionally switched off. The power supply is used to provide the emergency system with 24 V DC. 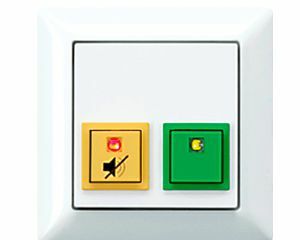 The service unit can be installed, for example, in a staff or reception room and likewise signals there that an emergency call has been initiated. 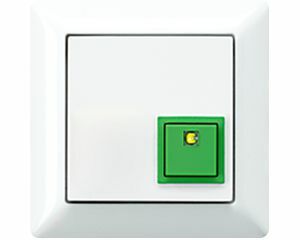 The green button indicates presence, the yellow button suppresses the acoustic signal of the emergency signal for 20 seconds. This is installed in the same room as the pull cord push button, for example, next to the washbasin, and serves as an additional control point to initiate an emergency call.